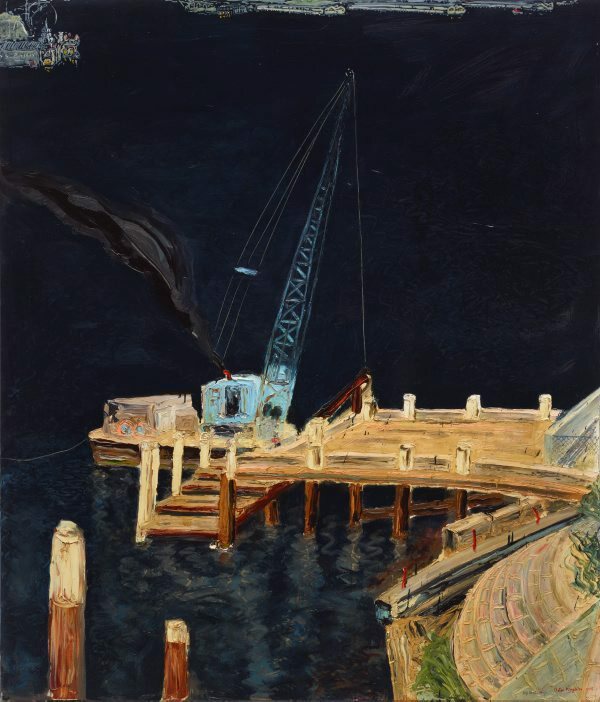 Moving to Sydney's Lavender Bay in 1972, Kingston has always taken delight in bringing the harbour's grandeur to the fore in his drawings, prints and, more recently, paintings. Exploring the harbour in his timber launch M.V. Anytime, which he purchased in 1997, Kingston makes direct studies which possess a raw beauty, and express the artist’s deep regard for his marine environment. "When I moved to Lavender Bay in 1974, there were many boatsheds and slipways giving character to the place. It was a working bay full of interest…The boatsheds were timber and ramshackle and a joy to draw and paint. Now, there are no slipways. Only two boatsheds remain." 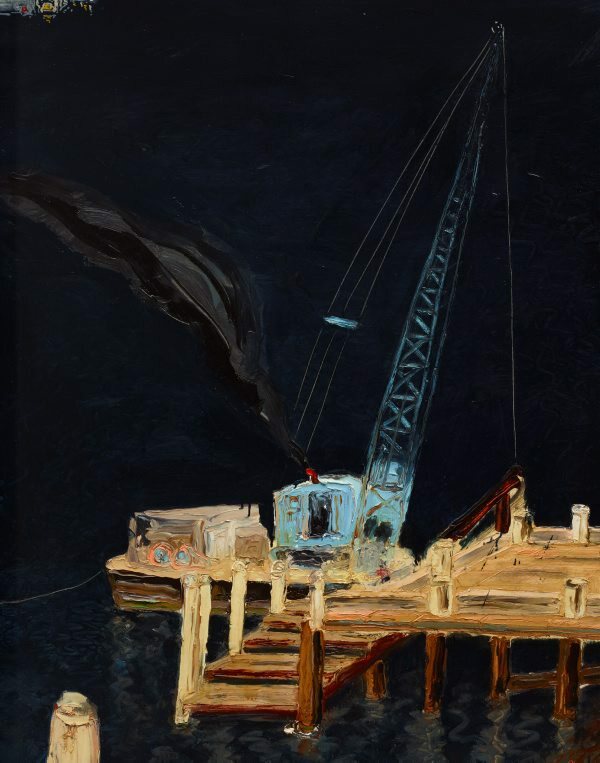 In 'Big Saturday' Kingston's energetic handling of paint permeates the deep blue expanse of canvas, traversed by the stretching reach of a crane, which is moored to the protruding jetty. He reminds us that our harbour city is imbued with a rich diversity of industrial as well as natural beauty. 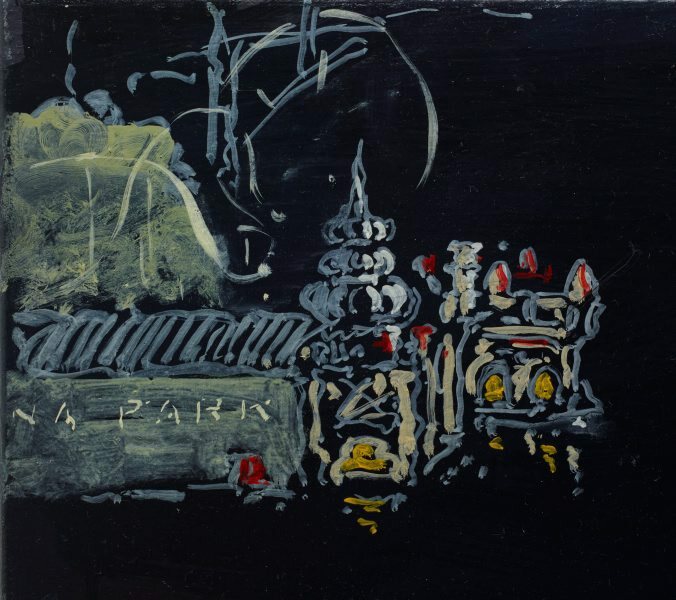 Signed and dated l.r., red oil "Peter Kingston 1995". Jill Sykes, Look , 'Tale of two artists: a dance of fantasy and reality', pg. 18-20, Sydney, Oct 2006, 18 (colour illus.). Natalie Wilson., Notes from the river caves: Peter Kingston and Martin Sharp , 'Notes from the River Caves: Peter Kingston and Martin Sharp', Sydney, 2006, (colour illus.). Website catalogue for the 'Notes from the River Caves: Peter Kingston and Martin Sharp' exhibition held at the AGNSW in 2006.